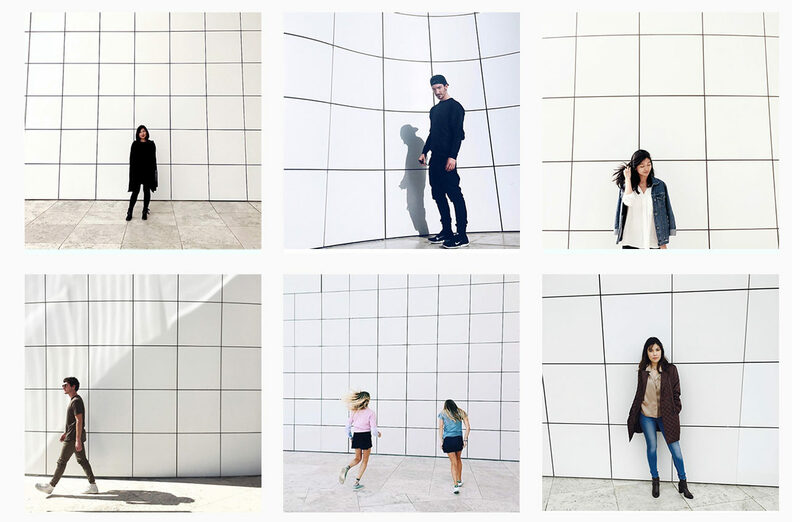 Why Are So Many Instagrammers Taking the Same Photo at the Getty? Instagrammers at the Getty Center. Top: @mahshimote, @taylorkahan, @a.wu. Bottom: @ashleyschwab, @eviecant, @ohsoangelic. As a social media manager, I have the privilege of monitoring all of the mentions and tags of the Getty on Instagram, the modern art gallery so many of us now carry around in our pockets. Among thousands of posts each week—and I do mean thousands—I’ve noticed one image in particular that gets snapped over and over again. Sometimes when I’m walking through the museum, I actually come across people taking this exact picture. A person wearing dark colors walks next to the unique grid pattern of the building’s cladding. The bold contrast of the colors of one’s outfit against the pristine, minimal white of the building produces a look straight out of a high-fashion magazine, and that’s why people are drawn to it—or so I thought. To find out what appeals to so many photographers about this combination, I combed through our tags and mentions to track down a few up-and-coming Instagram stars to find out how they found out about the Getty, and why they took this iconic image. I’m from London in the UK. What inspired you to take this picture? I’m obsessed with futuristic and unusual architecture. I love combining my outfits with incredible scenery, so when I saw the wall, I just had to get a picture in front of it. 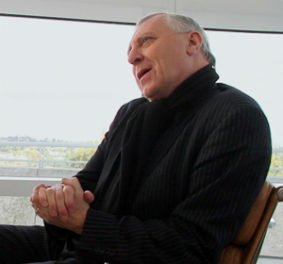 How did you discover the Getty? My friend and the photographer of this photo @thismintymoment showed me the Getty— he lives in California so when I came to visit he showed me his favorite places to shoot. This image was taken by my boyfriend. We both like to “keep it simple” when taking photos. In front of the grid wall is not as crowded as other places, which makes the images clean. This photo was taken on December 31, the last day of 2016. The “keep walking” pose I used indicates walking into the incoming 2017 and embracing a bright future. 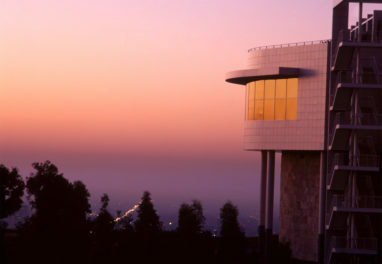 The Getty is one of the world’s largest arts organizations. It’s such a world–famous place that anyone who loves arts and architecture must visit. The simple and clean building impressed me a lot. We are from Atlanta, Georgia, and moved to L.A. two years ago. I love symmetry in photography, and the grid wall is a perfect geometric backdrop for a high-energy shot. We initially found out about the Getty just through word of mouth as an awesome spot to visit. We’ve been a few times now and always recommend it. I am from South Orange County. I love all of the minimalist architecture at the Getty, and the grid walls make such beautiful backgrounds. I knew of the Getty for a while because I love art museums, but I had never actually been. I attend Vanguard University, and one of my professors there offered us credit to visit an art museum. The Getty was the museum she recommended, so that is why I was there the day that picture was taken. I am from Helsinki, Finland, and one of my friends is from Rome, Italy. All the other people have multicultural backgrounds, but they are American and live in Los Angeles. We all decided to dress up in black and white (even though my skirt was light pink) and we of course wanted to capture our looks and whole crew. We thought that the beautiful white wall with a large space was good for showing all of us. The shadows looked amazing there! The light also formed a shadow in the picture of our photographer, which was nice and something we wanted. Great that we had her in our crew to get a great photo. I met my friends at another art venue and they told me about Getty. I had heard of it, and wanted to go. But they really took me there, so thanks to them. I really loved the place, and have recommended it to everyone. I’m from Clayton, CA, up in the Bay Area. We came to the Getty on a cloudy day so I brought my camera just in case something caught my eye. I loved the huge white square walls and felt that they’d make a simple but interesting background. I was also drawn to the symmetry of them, so definitely tried to keep that in mind while framing the images. I originally heard about the Getty just through word of mouth. It’s a fantastic space, so most people in Los Angeles know about it. This specific visit was to see Robert Mapplethorpe’s amazing exhibit, which was on display last year. 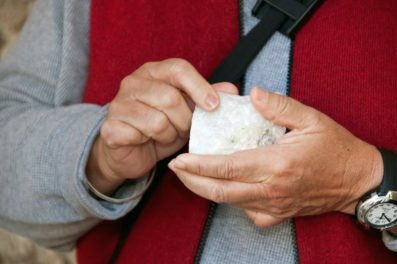 If you’ve taken photos at the Getty, we would love to see them! Share with us (@thegetty) on Instagram using #GriddyCenter (yes really).